Two BISC dance couples competed in the qualifying competition for the British Championships at Sheffield on September 22 … and acquitted themselves well. Tamsyn Pack and Richard Boaden, competing at primary level, came 3rd in the original dance (samba), 3rd in the free dance and 3rd of 6 overall. Kira Geil and Andrew Smykowski, competing at junior level, came 2nd in the compulsory (rhumba), 2nd in the original dance and 2nd of 7 overall. Kira and Andrew stayed in Sheffield for four days of intensive training with Jimmy Young, who used to coach their coach David Phillips, before flying to the Czech Republic for the Junior Grand Prix in Ostrava. Kira Geil and Andrew Smykowski competed really well to come 12th out of 16 in the compulsory dance (rhumba) in the Junior Grand Prix in Ostrava, Czech Republic, earlier this month. They got a good draw for the original dance but unfortunately didn't have the best skate and dropped two places to 14th. The free dance went well, although they came 15th, which gave them an overall placing of 14th. They say it was a wonderful experience to represent Great Britain at this level of competition. “Both of us learned a great deal and we are now using this experience to prepare for the 2003 British Junior Ice Dance Championship at Sheffield in December,” they said. Having won bronze last year, they are determined to win the title in what promises to be a very close and exciting competition among the top three couples this year. Compulsory dance, Level 4 and under: Viv Coene, 3rd, Sue Truby, 5th, Gail Tudor, 7th, out of 10. Free dance: Gail, who did not skate her best, came 7th of 12 in the under Level 6 class which was won by an 18-year-old Chelmsford skater who competes at senior level as a free skater and is about to take Level 5-6 dance tests. Viv did not compete because she doesn't have a suitable programme and Sue withdrew because she was unwell. . Both BISC's synchro teams, the renamed mixed age team Ice Fusion and the novice Ice Precise team, are working hard in preparation for the qualifying competition at Nottingham on November 9 for next year's British Synchro Championships. The teams are not expecting their coaches, David Phillips and his wife Lucine, to accompany them as the date is close to when their baby is due. The synchro team managers, Sacha Hartley and Sally Pitcher, and all the skaters wish them a Happy Birth Day. It has been decided that Ice Fusion will perform its Queen compilation programme in the pantomime. Meanwhile Becky Highcock has been named Skater of the Month for September. 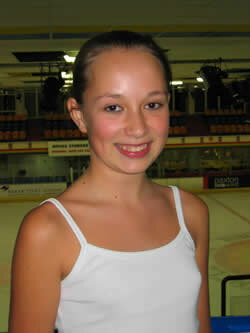 Becky, 13, skated with the Solihull team for a year and the Slough team for two years before joining Bracknell's Ice Precise and the Bracknell-Slough Ice Fusion teams eight months ago. She was selected because she is an ideal synchro skater - always punctual, polite, a good listener and enthusiastic team member.